One of my new housemates* keeps chickens and quail, both for eggs. The chickens were producing their one a day, but has been a bit reluctant since the heat wave at the beginning of the month. The quail though, are quite spectacular, delivering 13 eggs between the 11 of them every day. My mind boggles at the interior operations of those birds. 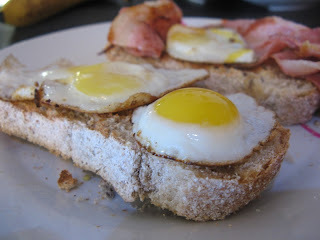 Breakfast: toasted some of Monday's bread - mostly white, with some seedy bits. A streak of bacon and then four gently fried quail eggs. They are tiny. The fragile shell contains a tough membrane, so cutting the tops off is the only reliable way of getting them out with the large yolk in one piece. Even so I only managed to get one whole onto my toast. The large yolk gives it a creamy texture, with a flavour maybe slightly less eggy than chicken can sometimes be. * Proper post on my new living arrangements and cohabitants in preparation. Because it's worth writing about. dit lyk vreeslik cute. wil jy nie van hul piekel ook nie? OMG so jealous!!! Was talking to friend Mimi last night about bringing quail eggs to them for dinner tonight (donders duur)...lightly hard-boiled, peeled, and dipped into little dishes of mixed slat and pepper.Heerlik. Pictures of your quails?